Hannah Genders scrubs up for a voyage of discovery. I have always loved the sea and thankfully have never been ill on a boat, even on the ferries to northern Spain we have been using of late to get to a cycling destination. So when I was asked to do a series of lectures on a gardening-themed cruise, it was with the knowledge of good sea legs (and the opportunity to give my mum a holiday) that I said yes. I was asked to join a P&O ship called Artemis, which was making a 30-day journey from Southampton to the USA and back. It was due to sail on September 30, arrive in Madeira a few days later and travel at sea for seven days across the Atlantic. I would be flying home when it reached Florida, with other lecturers taking over on the homeward voyage. With only my ferry crossings as experience, and armed with what I thought was an amazing amount of clothes in my luggage (on our normal cycling holidays I manage to live out of two small panniers for a couple of weeks), we boarded the ship in Southampton and looked forward to the adventure. Artemis is one of P&O’s smallest and oldest ships, although it seemed enormous to me with nine decks and 1,200 passengers. It is also one of the dressiest ships, with more nights of formal dining than most of the others – I was very unsure how I would cope with that as I am used to being a scruffy gardener, but my mum was looking forward to seeing me a bit more done up. My commitment on the ship was to give a series of lectures on my work, the titles of which I had submitted beforehand. I had decided to talk about the aspects of gardening that I am most passionate about: growing my own vegetables, sustainable design and therapeutic gardening. I was a small part of the continuous entertainment on board the ship every day. On the first leg of our journey we had bad weather for the few days it took us to reach Madeira, and it took a while to get used to the layout of the boat and dressing for dinner every night. We reached the port of Funchal very early in the morning and it was magical to see the dawn come up over this beautiful, mountainous island. Madeira is in the Atlantic off the coast of East Africa and although the weather is warm, it has a larger amount of rainfall than the Canary Islands to the south. This makes it a very green island and ideal for growing lots of tropical and subtropical plants – it is especially rich in floral diversity and so was an ideal place to stop on a gardening cruise. There seemed so much to do; one of the hardest tasks we had was to narrow down our options for our one day on land. We decided on a visit to the famous fruit and flower market, followed by a trip to the orchid house and Madeira’s botanical gardens. The market was a treat, as much for the fresh local fish being sold as for the flowers, and we tried some amazing and unusual fruit. A short taxi journey up the hill (actually everything is uphill on Madeira) was the Jardim Orquidea or orchid garden, owned and run by the Pregetter family who originate from Austria. 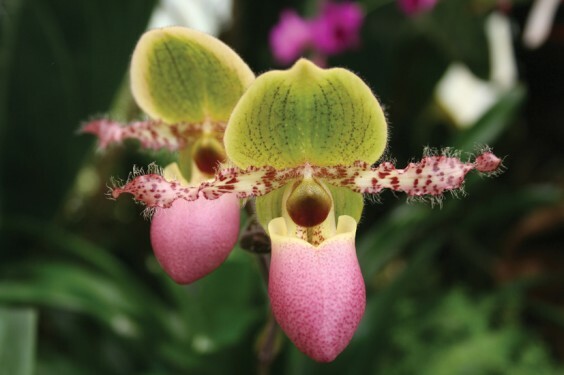 The family has an amazing history of growing orchids that dates back to 1905. The colder climate in Austria ultimately made them decide to move the whole operation to Madeira in 1991. The feel of the gardens are very natural as they try to display these beautiful flowers in a very natural setting. I would recommend a visit to anyone visiting Madeira, especially the little Austrian coffee shop run by the family’s daughter, which overlooks the bay of Funchal and from where we could see our ship moored with two other cruise liners. From the orchid house we walked a short distance to the botanical gardens of Madeira to see the diversity of flora that can grow here. The gardens contain more than 2,500 plants, some in glass houses but mostly out in the open enjoying their wonderful climate. We would recognise some of the exotic flowers from our conservatory and indoor plants, but I can honestly say there were many plants I had never seen before and the smell of the ginger plant flowers was gorgeous. With all that inspiration it was time to head back to the ship and continue on our seven-day crossing of the Atlantic. I have to say that I thoroughly enjoyed the experience of cruising, although I did find all the dressing up a bit tiresome and I missed seeing trees and flowers while at sea. My talks seemed to be well received and I think my mum has already packed for the next trip!